SHEFFIELD veteran Malcolm Elliott (Pinarello RT) won the Shropshire Star Newport Nocturne with a brave solo attack with 30 minutes of the race remaining. In front of hundreds of enthusiastic spectators, 46-year-old Elliott stayed clear of the chasing field to cross the line almost a minute ahead of his nearest rivals, while the majority of the bunch were another ten seconds off the pace. Despite the field containing such big names as British Tour de France stars David Millar, Geraint Thomas and Mark Cavendish, Elliott used his experience to take the honours, while Tony Gibb (Plowman Craven RT) was second and last year?s winner Chris Newton (Recycling.co.uk) third. Elliott had escaped alongside Gibb and Newton after 15 minutes, but after opening up a small gap Newton and Gibb appeared to hesitate about chasing, and one lap later Elliott – the former points winner of the Tour of Spain – had gone. Meanwhile, in the Past Masters race Sid Barras also scored a solo victory, crossing the line 14 seconds ahead of Steve Jones, while Phil Wilkins was third, another three seconds off the pace. 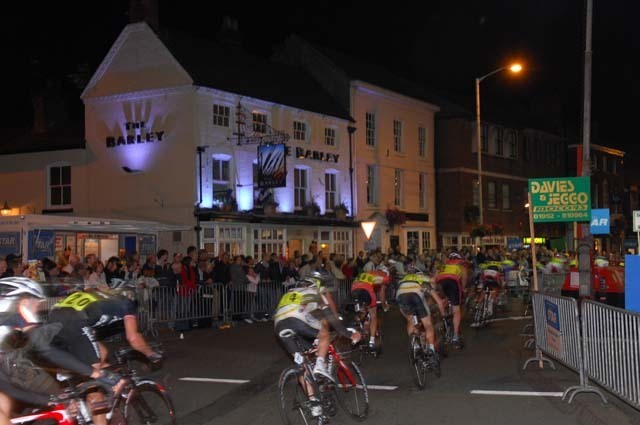 For a full report from the Newport Nocturne, check out this week?s Cycling Weekly.